Rear Admiral Raja Menon contends that nations embroiled in Continental wars have historically had poor maritime strategies. He develops the argument that navies that have been involved in such wars have made poor contributions to politial objectives, and outlines future strategies. Rear Admiral Menon is the author of an important new work that every serious student of the current fast evolving naval scene should read. "Reading this thought-provoking book (highly specialised as it is) - so far removed from the blood and gore and horrendous physical (and psychological) pain of warfare - the reflection came unbidden that, if laughter is supposed to be a typically human trait, then warfare is surely an even more exclusive one." " A well-researched book of considerable interest … A good addition to all libraries." "Brilliantly argued, this book explains what speed and strategy can do … Maritime Strategy is brilliantly argued and backed by the author"s impressive historical perspective … A must for defence planners." "Excellently researched … Menon"s fascinating foray on land and at sea is replete with history and strategy of wars and the evolution of naval strategies." "Though it is not the first to think through the frustrating problem of how to use naval force in a war on land, the book"s importance lies in that it actually provides some credible solutions." 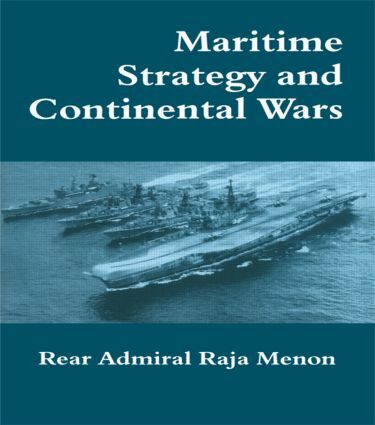 "Menon"s arguments are so rich … that they at once constitute a new treatise on maritime power for the 21st century and a "How to" manual for navies struggling with the resource crunch and the desire to be relevant in a new age." "Useful review of maritime strategy literature and role of maritime forces in past continental wars dating from the 1800"s"